Make sure to tune into the PC Game Show live stream this evening! 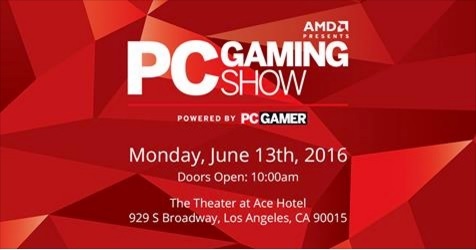 Clear your schedules, set your alarms, and fire up your rigs to join us for the E3 Expo 2016 PC Gaming Show this Monday June 13th at 11:30 AM PT (18:30 PM UTC). As one of the Show's proud sponsors, Bohemia Interactive will be showcasing the upcoming Arma 3 Apex expansion with a brand new trailer, and announce its final release date. Plus, be sure to stick around for the extended After Show, where Day Z's Creative Director Brian Hicks will be interviewed by PC Gamer editor Tom Marks about the approaching 0.60 update.